That bald spot of mine appears to be growing year by year. 2015 is nearly over, and another Bottoscon has come and gone (really, where has the time gone?). This was a good one, the best attended yet! I went over on Friday with Ian Weir (Red Sash Games) and Michael Junkin. After a bite I got set up at two tables that I kept filled with my games all weekend, either being displayed or played. 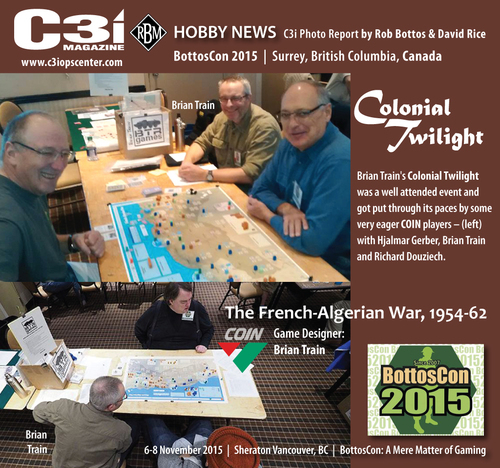 There were three test games of Colonial Twilight, all played with the short (3 Propaganda Rounds) Tournament Scenario: Friday with Andrew Laws and Stephen Graham (all 3 rounds, Government Victory on final round), Saturday with Mike Mahoney and Rick Smith (all 3 rounds, FLN closer to victory point than Government on final round), and Sunday with Hjalmar Gerber and Richard Douziech (game had to be packed up after 2nd Prop round but FLN was doing better). Players had varying degrees of prior experience with the COIN system. All agreed this was a significant departure from other COIN system games in terms of playing speed: same amount of actual action per card – two factions get to one thing each – but with only one adversary to worry about, not three, the tempo of the game gets cranked way up. The Initiative Track, that makes the leader of the dance pass back and forth between the two players, was thought to be a clever idea. Other games: I helped Ian Weir and Rob Bottos through most of a game of Ukrainian Crisis with the revised rules (will be uploaded shortly to this blog), and Rick Smith helped me a lot with clarity and mechanics of my latest design, The LIttle War – a mini-game on the Slovak-Hungarian border conflict of March 1939 (you mean, you didn’t know about this one?). Won as a door prize, a copy of YAAH! Magazine #3, with a very nice interview of Volko Ruhnke and me by Roger Leroux on the COIN system generally, plus another long article by Roger of his impressions of the games in the system. Machine of Death, a curious sort of morbid party game by David Malki!, who was at the Tableflip conference in San Francisco last October. Some back issues of Canadian Wargamers Journal with variants and things in them. Sold a few copies of Andartes and Tupamaro too. I generally go to only two conventions a year: the big Consimworld Expo in Tempe, and this local con. It’s always great to meet people, walk around and talk to other designers about their work and projects. Rob works so hard to set this con up, and everyone appreciates it. Thanks also to GMT, One Small Step Games and Tiny Battles Publishing for being so generous with door prizes too!